NASA engineers are forging ahead on work with an experimental planetary lander after a test vehicle's crash Thursday (Aug. 9), agency officials say. The unmanned Morpheus lander exploded shortly after lifting off Thursday from NASA's Kennedy Space Center in Florida, putting a premature end to its first-ever free-flight test. But the setback won't put an end to Project Morpheus, officials said. "Unfortunately, that's part of development, especially lean development," said Brandi Dean, a spokeswoman at NASA's Johnson Space Center in Houston, which is leading the Morpheus program. Morpheus has cost about $7 million over the last 2 1/2 years. "We learned a lot from the tests we've done so far, including yesterday's," Dean told SPACE.com. 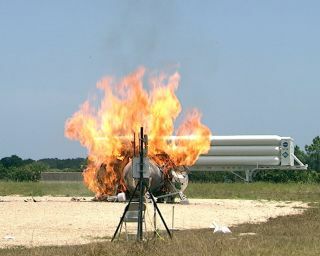 The experimental Morpheus lander, which is about the size of an SUV, is powered by liquid oxygen and methane propellants. These are safer and cheaper to operate than traditional rocket fuels and can be stored for longer stretches in space, NASA officials say. The vehicle is also testing out automated hazard-detection technology, which would use lasers to spot dangerous boulders or craters on the surface of another world. Morpheus could eventually deliver about 1,100 pounds (500 kilograms) of payload to the moon, NASA officials say. The hazard-detection system could also be modified to help spacecraft rendezvous with asteroids in deep space, a key priority for NASA. In 2010, President Barack Obama directed the space agency to work toward getting astronauts to a near-Earth asteroid by 2025. The lander that crashed Thursday is apparently a lost cause. But JSC and its Morpheus partner, private spaceflight firm Armadillo Aerospace, have already begun work on another vehicle, which could be ready for its first tests by early 2013, Dean said. The second lander will not pick up where the first left off, however. It would have to work up to a free-flight test, going through a series of tethered flights first, Dean said. The vehicle that crashed Thursday made 20 tethered flights before NASA cut the apron strings. Follow SPACE.com senior writer Mike Wall on Twitter @michaeldwallor SPACE.com @Spacedotcom. We're also on Facebook and Google+.